All the DR150 rigs feature a sliding tophead. 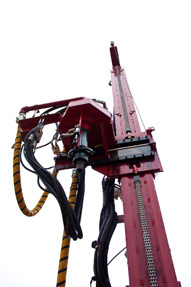 With a press of a lever, the drilling motor assembly (the tophead) slides over to the left and gives completely clear access to the borehole for the winch. This is essential when installing the casing and pump into the finished well. The the winch sheave assembly at the top of the mast can be hydraulically extended to 21 feet for easy handling of standard 20 foot casing and pipe. This particular DR150 track rig was fitted with an optional high torque motor on the tophead. This is a piston-type motor and is much more efficient than traditional hydraulic motors. It can also operate at higher pressures for more torque (turning force). On all drill rigs, not just ours, there can often be difficulty separating the drill rods (“un-threading”) when coming out of the hole after drilling. The extra torque eliminates that problem on the DR150. A side benefit of this motor is much longer life. With properly maintained oil filters there’s every reason to expect this motor to last the twenty-year (or more!) lifetime of the drill rig. As with many things, cleanliness is next to godliness when it comes to hydraulic systems. We have a total of six hydraulic filters on the DR150. The single most common cause of drill rig failure (this applies to any brand of drill rig) is contamination in the hydraulic oil. We do everything possible to get that oil clean and keep it that way. The filters are conveniently mounted for maintenance. We put easy-to-see-and-read indicators on them so the operators know when to change the filters. 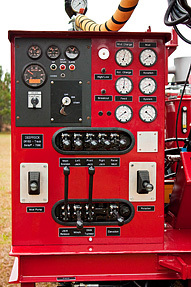 Even though the DR150 is a large, powerful drilling rig, the controls are amazingly simple and easily understood. This partly accounts for our widespread popularity in developing nations where technological sophistication is minimal. 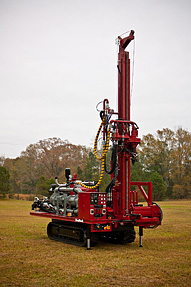 It also makes our line of rigs popular with first-time drillers such as HVAC contractors who opt to drill their own holes for geothermal heat pump loops. Relief agencies who provide water for some of the world’s poorest people often turn to our machines for their ease of operation and simple, rugged reliability. Most buyers meet with us at the factory to get some “hands-on” experience with their rig. It only takes a few minutes for them to become comfortable with the controls. Of course there’s more to drilling than simply knowing how to operate the rig (you can drive a car after a few minutes of instruction, but that doesn’t make you a good driver), but at least the new drillers can focus on the drilling operation without being burdened by a complex, difficult-to-operate drill rig. 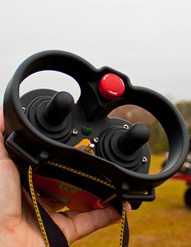 This DR150 Remote Control allows the operator to position himself anywhere when “driving” the rig. It’s especially advantageous to put yourself out in front of the rig so you can see any obstacles. A machine this large really obstructs the operator’s view if he has to walk behind the rig. Furthermore, the radio is much safer in placing the operator at a good distance from the moving machine. 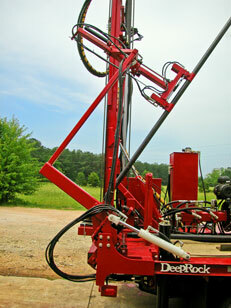 With over 40 years of continuous experience building water well drilling rigs, DeepRock is able to provide each customer with a rig custom tailored to his or her precise needs. Do you have a new or used truck that you would like to use as a platform for a drilling rig? DeepRock can do it.! Because many DeepRock rigs have their own power source, rigs can be mounted to a customer's existing truck at our facility or we can ship the rig in skid form to the customer who can mount the rig to his existing truck or equipment.. 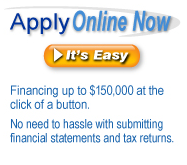 Complete engineering and technical support is provided by DeepRock. Every DeepRock rig is engineered with our customers' needs in mind. Requests and suggestions from our customers for special features and drilling configurations have been incorporated into our entire product line. Combined with DeepRock craftsmanship, these innovations have helped DeepRock produce a line of rigs that is unsurpassed in the industry for versatility and efficiency. Automatic Drill Rod Loader, which revolutionized the industry, is just one example of engineering that was inspired by customer requests for faster, safer and better ways of drilling. In response to our customers requests for innovative financing solutions, DeepRock has partnered with Crest Capital to provide flexible, financing solutions tailored to our customers specific needs.